Highfields Restaurant at the Eagle Mountain House & Golf Club, located in Jackson Village, New Hampshire provides stunning vistas of the White Mountains from its wide expanse of windows to pair with Chef Vanessa Davis' intriguing classic comfort cuisine with a twist. Intriguing flavor profiles and artistic presentations that follow through on the palate make Highfields Restaurant a sleeper of a surprise in tiny Jackson, New Hampshire. 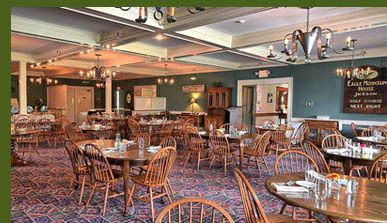 The historic hotel and restaurant located at the top of Carter Notch Road, provides the dining room of Highfields Restaurant with impressive views from the wall of expansive windows that perfectly frame views of the White Mountains, a favorite setting of artists and nature lovers. 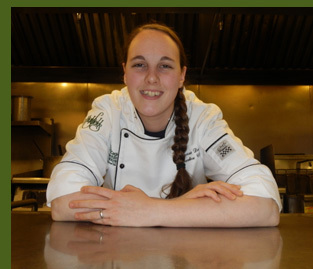 Chef Vanessa Davis is the young, creative talent in the kitchen, who joined the restaurant in the late 2015. Her focus is on using high-quality local, seasonal products, and making as much as she can in-house. In the summer months, she has the advantage of having a large herb garden on property. We had dinner at Highfields Restaurant in late February 2016, and the ambience was comfortable with vintage wood Eagle Mountain House & Golf Course signs along with framed historic photographs gracing the dark green walls. Single Gerber daisies and votive candles accessorized oak tables flanked with oak Windsor backed chairs. The menu is interesting, a blend of comfortable familiar offerings along with more intriguing items to tempt diverse palates. We love soups and began our dining experience at Highfields Restaurant with two of the appealing soups on Chef Vanessa Davis' winter menu. 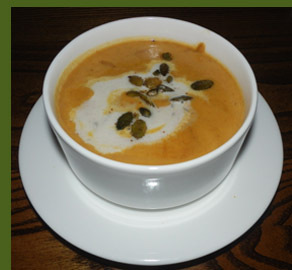 The Apple Cider and Butternut Squash Bisque made with local apples and squash, and garnished with diced apples, toasted pumpkin seeds and maple cayenne cream, was a delicious nod to Mount Washington Valley's rich bounty of local products. Rich, creamy, and hearty, the toasted pumpkin seeds added crunch and texture and the maple cayenne cream added a hint of sweetness and spice to the lovely apple and squash combination. 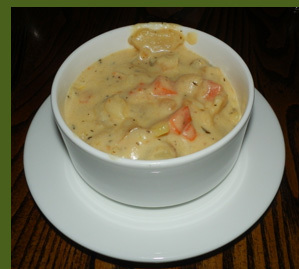 Also nice was the Roasted Root Vegetable Chowder made with an enchanting mélange of local root vegetables: celery root, parsnips, carrots, turnip, and sliced fingerling potatoes, garnished with bacon and garlic herb croutons, perfect on a cold winter's night. We could not resist the selection of hot rolls, presented with butter balls, olive tapenade, and olive oil to enjoy with our cups of soup. We continued by splitting a New England favorite for an appetizer, New England Cod Cakes, which were two generous cod cakes presented on a bed of baby spinach, drizzled with a white wine aioli, topped with parsley, accompanied by a small bowl of housemade tartar sauce redolent with chopped scallions and dill, and garnished with a lemon wedge. This was another example of Chef Vanessa taking a classic recipe and tweaking it to make it a bit better and make it her own. 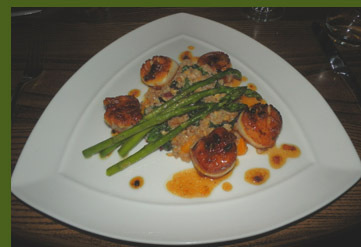 When our friendly and knowledgeable waiter, Lance, described the evening's entrée specials we knew we had to try the scallops and the tenderloin. The scallops were sumptuous; Chef Vanessa seared five diver scallops in bacon marmalade so that as the marmalade melted it created a delicately golden caramelized crust, and positioned them around a faro "risotto" studded with wilted rainbow Swiss chard and diced sweet potatoes, and topped with pencil thin asparagus, that made for a very memorable course. The scallops were well-paired with a glass of Clos du Bois, Chardonnay, from California, with its fruity nose of apples, pears, and citrus, and a rich creaminess on the palate. 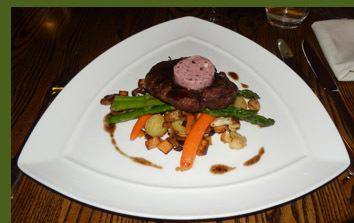 The tenderloin was stunning, cooked to perfection, crowned with foie gras, and presented on a bed of vegetable "hash" made with chopped fingerling potatoes, sweet potatoes, and grilled cauliflower, and served with asparagus. We paired the tenderloin with a glass of Ravenswood Vintner's Blend, Zinfandel, from California which had nice black fruit aromas that followed through on the palate. 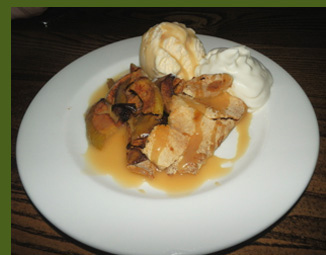 We ended our evening with the Free Form Apple Tart made with sliced Granny Smith apples, salted caramel, and accompanied with housemade vanilla nutmeg ice cream and whipped cream. The restaurant is open daily for Breakfast from 7:00 am until 10:00 am, and for Dinner daily from 5:30 pm until 9:00 pm. On Friday and Saturday the restaurant is open from 11:30 am until 10:00 pm. Eagle Landing Tavern is open for cocktail libations throughout the year and for lunch during the high season. 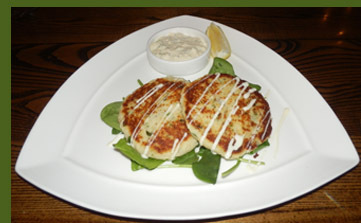 In the winter months, the tavern offers a daily Apres-Ski Menu from 3:00 pm until 6:00 pm. Read the interview with Chef Vanessa Davis and get her recipes for Curried Vegetables with Rice Pilaf and Coconut Curry Cream Sauce and her Orange Bowl filled with Orange Curd in the Chefs' Recipes section. Read more about our experiences in the Mount Washington Valley of New Hampshire in the Restaurants, Chefs' Recipes, and Gastronomy sections. © March 2016. Luxury Experience. www.LuxuryExperience.com All rights reserved.